For the last fourteen years (since we moved here) I have had two large square bare spots on the wall … located right behind my build-in sewing desk and beneath a (screwed onto the wall) wall-unit book case. My sewing machine blocks over one of the spots but the left bare spot has been staring out … begging for something colorful to be placed there. Last year while cleaning out and about my craft room I had sat this four slotted frame there on that place of the sewing table to keep it safe while dusting. I kept forgetting to move the frame back into my storage area within the closet and kind of became used to seeing the frame sitting there, leaned back against the wall, covering up that bare spot. 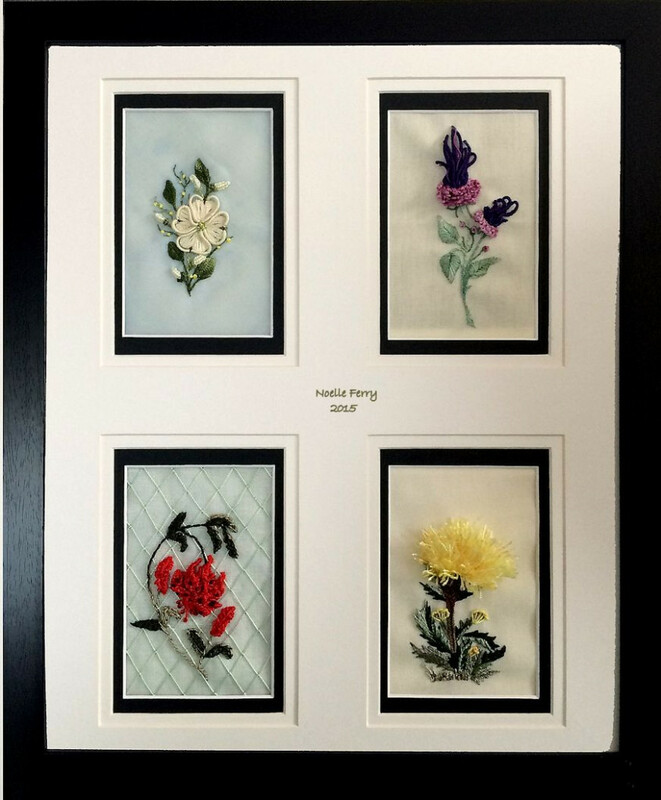 With the idea of using a few hat boxes (great places to hide my sewing odds and ends) as a way to ensure the frame didn’t slide down on the smooth top of my sewing desk, I left it alone considering if I wanted to put worked embroidery pieces or four photos into that frame.. I wanted colors so the strong colors and dimensional textures of the Brazilian Embroidery pieces I was working on seemed just right for those four display areas within the frame. 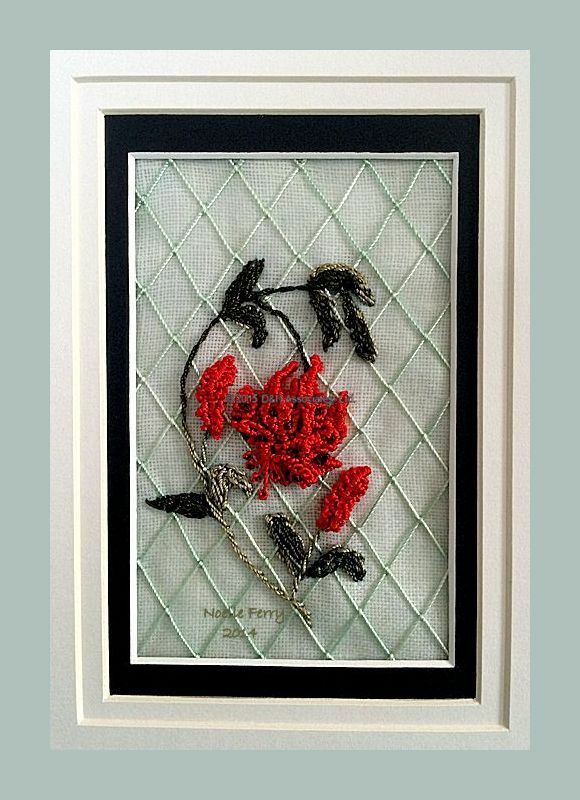 The frame is 16 x 20 inches, the four window areas are about 3.5 by 4.75 inches. I wanted a color background so I printed out a pale blue color on printable fabric (Extrav Organza Silk For Inkjet Printing) and overlayed the design printed fabric with the blue color organza. 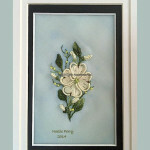 Click here to view my detail web page about this worked dogwood design. The designer is Maria Freitas. The worked design is 1.5 x 4 inches, preprinted on poly/cotton creme color fabric. 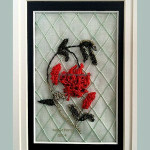 I selected this design because I like to work the scalloped looking knotted double cast-on stitch. Click here to view my detail web page about this worked bullion rose design. Designer is Loretta Holzberger and was purchased from her website. 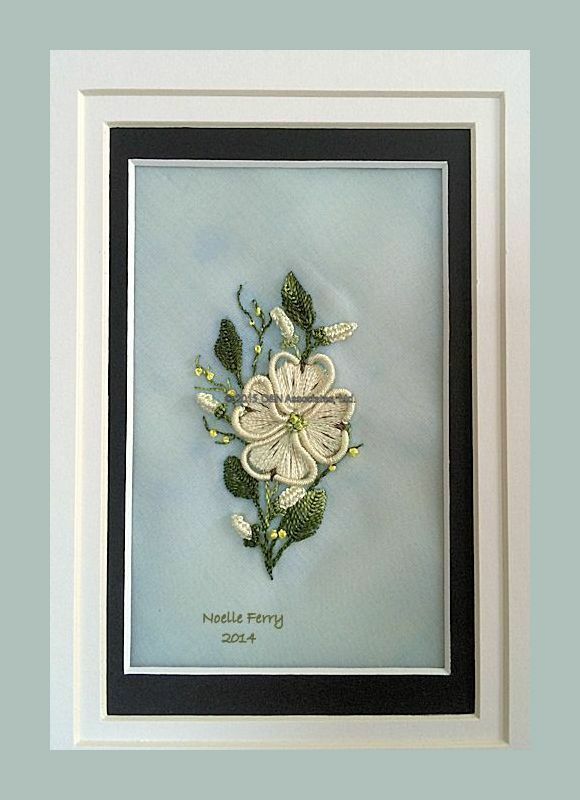 This tiger lily design with a stitched diamond grid background was downloaded as a pdf file. 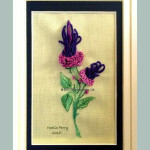 The brilliant flowers are worked in knotted double cast-on stitches. Stitched area is approximately 4 x 6 inches. 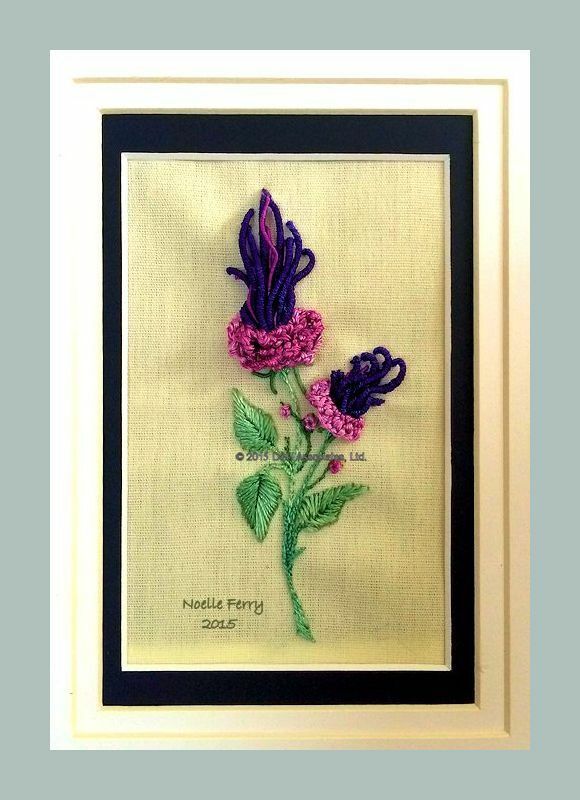 Click here to view my detail web page about this worked tiger lily design. Designer is Maria A. Freitas. 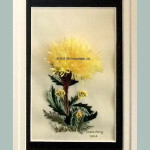 This is the yellow cornflower from the Primavera design. 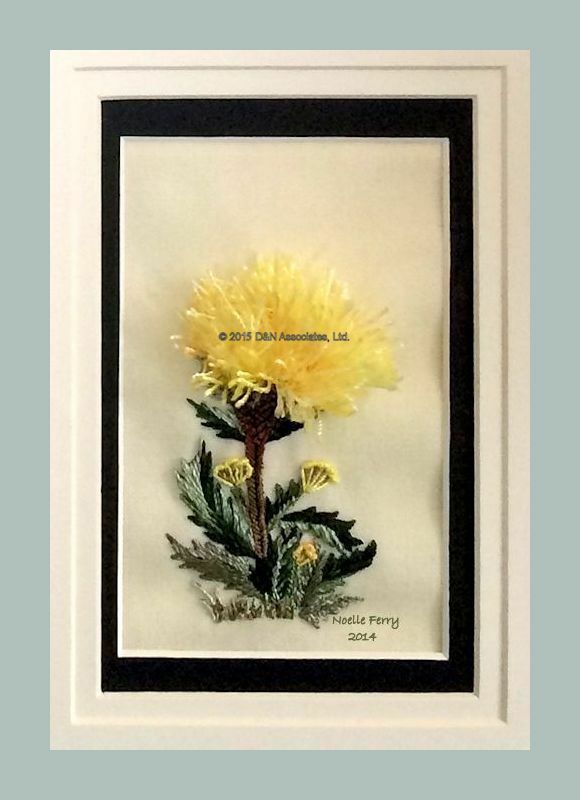 Click here to view my detail web page about this worked yellow cornflower design.